This interview with Peter Blegvad, John Greaves and Chris Cutler was conducted in July 1996 at the MIMI Festival (Arles). The first time you three played together was in '74, in Slapp Happy/Henry Cow. Did you only record in the studio or did both bands also play concerts together? (PB) No. We never got that far. We made the record "Desperate Straights" together, and then we made "In Praise Of Learning" together, and then we began rehearsing towards the idea of touring together. And in the course of that, it was discovered - not to my surprise - that I actually couldn't play Henry Cow music. The chords and the time signatures were too complicated. And... just generally, Anthony and I felt kinda lost. And Dagmar, who could cut it perfectly well on that stuff, was retained. But for about a year, though, we were an amalgamated group... Maybe it was less than a year... In those days... a little bit of time seemed like a lot of time! How did the idea come about to amalagamate ? (PB) Yeah... I think we only got signed because Chris and maybe other Cows heard the demos that we'd done and said "hey, you gotta sign these guys!". (CC) A lot of people in Henry Cow were interested in playing pop music. That's what they had all done before. Was there any particular reason why Henry Cow had never played vocal material before? (CC) Oh, we did... It wasn't on record, though. (JG) Yeah. But there was definitely stuff made before that, which we did on the Peel Sessions or stuff, I think. There was Fred singing his folk songs! At your Paris concert last April, you barely touched your bass. Too difficult to be a singer AND a bass player at the same time? (JG) Yeah... But that's only a temporary thing, that's one side of what I'm doing, and I do like it a lot... I can sing and play at the same time, but if I can get Paul Rogers to play double bass, and Sophia to play piano... it's quite an ideal thing, and I can sing better anyway. So that's not the whole story, but I like that format. Peter and John, you've worked together several times since "Kew Rhone", but you never did material that was similar to that. What made this album so special at the time ? (JG) I think it's because that was still very complicated music which basically doesn't turn Peter on. So you had a hard time doing that album ? (JG) ... a VERY long time! [to John & Chris] But as far as you two are concerned, you still go for complex music? Can't you create the chance? (CC) Well, when I get the chance to create something, it's usually in a slightly different direction. I suppose "Domestic Stories" was pretty complicated, that was the last one. That's why I wrote all the texts. Usually when I write all the texts, it's impossible to set a 4/4... You know, when you say groups, like Nick Didkovsky's group, or U Totem, they are a dying group, there are hardly any groups that compose music of that sort these days. [to John] Same problem for you ? (CC) Young people can do it! (PB) Doctor Nerve is a good example. Eleven years, they said they've been together. And they may spawn an imitator or two, who knows, they're so good, it wouldn't surprise me at all!... But you know, people want quick rewards, it's nothing new, but I think it gets more and more extreme. Do you feel interested at all by these new musical forms derivated from the new electronic equipment, like techno and stuff? (PB) There's some great stuff, very good stuff... Yeah! But you're not interested in using that yourself? (PB) I'm always sort of put off by the enormous sums of money you have to invest to acquire good samplers and things like that. Nevertheless I was very serious about it. (JG) Yeah... but it would be a different style, (to Peter) I mean you're not interested in doing techno stuff yourself? (PB) Mmh... (laughs) Not really, no! But techno means... does that mean using samplers? (PB) On that record of John and me that you have here - what's it called? "Unearthed"? - yes, with the texts... John was able to do the music there, on a little computer, it's all done with 'technology', really. Strange, cause your music tends to get more and more acoustic! Peter, what level of success do you enjoy? Are you more successful in the States or in Europe? Why did you come to Europe in the first place ? (PB) My family moved in the early 60's, when the climate in America was becoming increasingly nasty. The assassinations of JFK and Dr. Martin Luther King, and the Vietnam war... various things - it was getting kinda nasty. My brother and I were becoming of an age where we could be recruited into the army, and my parents both had connections in Europe, and a cheap appartment became available in London. All those things. (PB) I'm a New Yorker... My father's Danish, my mother is a New Yorker. I was born in New York. Do you still feel an American after all these years spent in Europe? (PB) Yes, I have to say. I spent almost half my life in England, but actually that tends to make me feel even more American. None of you is English, but you still get billed as a 'British trio'. What's your reaction to that ? And you, John, do you feel Welsh ? (JG) Very Welsh, thank you! (laughs)... Curiously, though, it comes out from time to time. I have no particular fondness either for the country or the people, or the language, which I don't know very well... But sometimes... maybe it's getting older, but there is a certain 'welshness' which I emphasize with. When the 'Five Nations' tornament [European rugby tornament] comes up, I become very Welsh. Several well-know 'Canterbury' musicians - Pip Pyle, Elton Dean and you, John - now live in Paris. Is France a better place for your kind of music? (CC) I don't think it really matters where you live, anyway, cause you don't play where you live. The last project I did was with one Canadian, one Japanese, one Polish and one German. And the next one will be with two Americans, one Yugoslav and an Austrian... The festivals are always somewhere else at the end of an aeroplane journey, and it doesn't matter where you start that journey. And it doesn't matter if you live with the people you're going to play with, cause mostly you don't rehearse every day of the month, in your backyard. Americans do that much more cause it's a big country. Was Britain once a good place for music like yours, at the time of Henry Cow, and then it changed ? (CC) France was better for us than England. But it was better in general, back in the late 60's and early 70's. France was quite good, and Germany became great in the last years, very supportive, lots of musicians doing lots of concerts, lots of festivals. Italy is now becoming... It moves around. Did things become harder with the punk era ? (CC) It didn't make any difference. (PB) I can remember Johnny Rotten saying in an interview, well, "I'd rather listen to Fred Frith than - I don't know - Mick Jagger", or... (laughs). National Health had things in common with 'progressive rock' bands like Yes and Genesis who were so criticized by the punks. (JG) Unfortunately, yes (laughs). That was the side of it that I didn't like. I liked... a lot of it, obviously. The more eccentric side of it, of Dave Stewart's compositions. 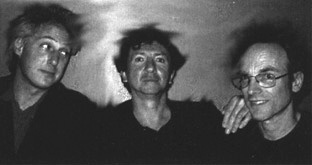 How many albums have you recorded so far, Peter Blegvad albums featuring John and Chris? (PB) Well, only one really, and we're working on a second one right now. (CC) I'd say two. I guess Downtime would count. (PB) Yeah, although John is featured on only a few things. Yeah, so two and we're working on a third! Can you say a few words about it ? (PB) Well, I think the new one is going to try and be a worthy successor to "Just Woke Up" and follow along pretty similarly. We think we have a good formula with "Just Woke Up", and we want to see if we can build on that. So we'll employ the same session men, B.J. Cole, Geraint Watkins and a few of the others too. So, basically, it's American sort-of 'roots' music, coming from me but then fed through and interpreted by (laughs) masterful European virtuosos of their instruments, so it changes it and comes out sounding pretty original somehow. Gives it a spin. (PB) It can, yes, a lot of it can, and in fact has to be, because it's usually prohibitively expensive to travel as a trio, this is a big treat for us, and in fact MIMI is our debut... because it costs so much money. Otherwise it's pretty cheap for me to travel around with only a guitar, so... that's what I usually do. [to John and Chris] How much of your own personality do you manage to feed Peter's songs with? Is it a group or do you rather feel like backing musicians? (JG) Er... Is it really contradictory being a group and being a group and being backing musicians? I don't think it is. (PB) I can say, as the composer, that they contribute a lot of the basic structural ideas to the songs, they change them a lot. I don't have ideas for the bass parts, arrangements, drums. I have very simple ideas, sometimes they're just the basis for what is eventually recorded. So it's a very creative relationship. (JG) Yes, I feel it like a compositional role as much as a playing role. I see you have scores for the songs here. Did you write down all your bass parts? (JG) No, I have little maps of the songs... just chord changes. (CC) I think it's not a question of being a backing musician *or* having you own ideas and expressing yourself. That's the problem, you have to find out what the song wants. (PB) That's a very good point. We're all equally serving the songs... slaves to the songs! (laughs). Would you 'serve' as rhythm section for other singers than Peter? (JG) Sure! Anybody looking for a backup band... and Peter can be in the band too! But seriously, in terms of what's actually going on, yes I'd like to do more stuff like that, but - of course - given it was really good music.